"A Destiny Among the Stars"
Athena is shot down by Cylons over a remote planet…where she meets her father’s young namesake. A lone Colonial craft is severely damaged by a Cylon patrol led by Vulpa Six. Vulpa Six wants to take the humans prisoner to learn the location of the fleet but, just then, the mysterious orbs of light return and miraculously repair the ship enough to transport it to the planet Arilos, where it crash lands. The crash is spotted by both a young boy and an old hermit in the desert. They meet for the first time near the crash site and the boy tells the old man his name is Adama. The boy and old man soon arrive at the boy's village to tell the inhabitants about the crashed ship. The villagers tell the old man to get away and never return. Meanwhile, a number of them head for the crash site to help. They find the pilot dead, but Athena still alive, though injured. They take her back to the village for care. Athena wakes up in the village and meets the young Adama, surprised to hear of someone having the same uncommon name as her father. 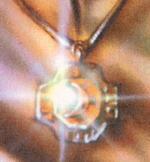 She sees that the boy wears a medallion similar to one she has seen her father wear in the past. It is revealed that when Athena was just a girl, her father had saved the life of a man. The two had worn matching Kobolian medallions to symbolize their friendship and that man had later gone on to name his son after him. Suddenly, the town comes under attack from the sky by a new Cylon patrol, again led by Vulpa Six, tracking down the errant Colonial craft. As the town's buildings begin crumbling around them under the assault, Athena and Adama flee together, searching for a place to hide from the centurion ground troops. The floor collapses under Athena and she is left clinging to the edge to keep from plummeting several stories. She tells the boy to go without her, for he is not strong enough to pull her up. Refusing to leave her, he tries to pull her up anyway. As she is about to slip away from his grasp, the medallion around his neck seems to pulse with the glowing energy of the mysterious orbs and gives the boy the strength to save her. As the two are about to move on again, Vipers from the fleet, led by Apollo, swoop in and wipe out the Cylon Raiders and centurions. From a hilltop overlooking the village, the old man observes and is pleased that the boy called Adama will now be taken to the human fleet overseen by the elder Adama, to assume a destiny in the stars, implying the old man himself is the boy's father. This story takes place in the Colonial yahren 7350, 8 yahrens after the human fleet's exodus from the Twelve Colonies. This story does not have a title of its own. I took the title "A Destiny Among the Stars" from a line of dialog within. 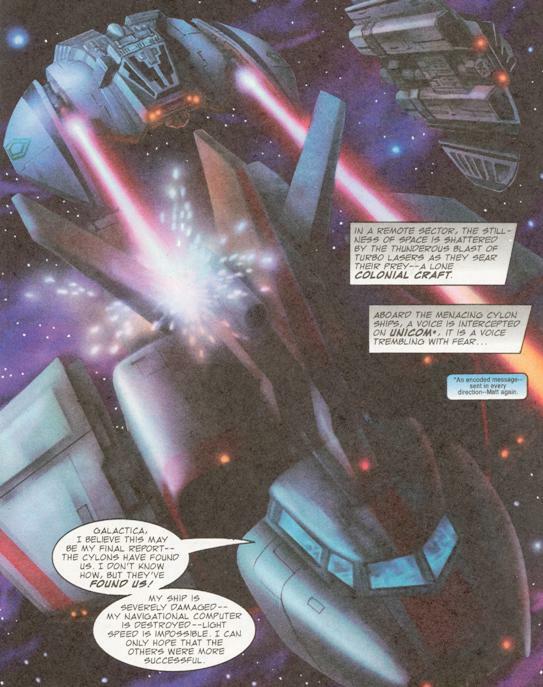 This story features writing and art by Chris Scalf, who would later become the "founding father" of the BSG series of comic books published by Realm Press. 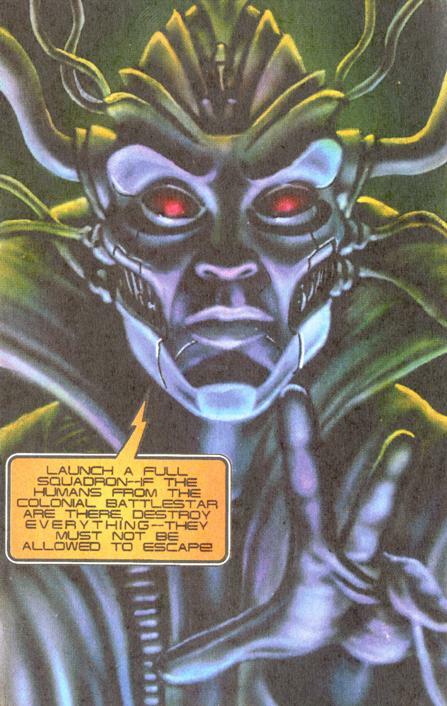 The character of Vulpa Six seen in this story would be retroactively introduced earlier in the timeline in Realm Press' Battlestar Galactica #2, "The Law of Volahd" Part 2. On page 1 of Part 1, the pilot of the Colonial craft sends out a Unicom signal to the Galactica as he's being attacked by the Cylons. Unicom is an encoded message between Colonial forces. The word was first used in "The Living Legend" Part 1. Notice that the Cylon Raider that strikes the Colonial craft is a different model than the standard ones and has extended wings similar to the craft flown by the Cylon-augmented Boomer in "Masquerade". The Raider seen here is revealed to be piloted by Vulpa Six, the augmented Command Centurion who was last seen in "The Law of Volahd" Part 2. On page 3, we see that the seating arrangement of the three Cylons in the Raider is the opposite of the norm as well, with Vulpa Six's center seat in the front and the two support centurions at left and right behind him. The Colonial craft, referred to in Part 2 as shuttle Alpha Nine, is of a type not seen before. Sort of a cross between a shuttlecraft and a Viper, as seen below, being fired upon by Vulpa Six's Raider. The mysterious glowing orbs, last seen in "War of the Gods" Part 2, return here to save the Colonial shuttle. They are referred to here as Seraphs for the first time. "Seraph" is a term from the Old Testament of the Bible, meaning "burning one" and referring to a type of heavenly being (an angel). On page 5 of Part 1, Vulpa Six implies that Spectre is in command of the patrol's home baseship. In "The Law of Volahd" Part 2, Vulpa Six was given command of his own baseship to pursue the human fleet. Since this story takes place some yahrens later, Vulpa Six presumably lost command in a story yet to be chronicled. It makes a certain amount of sense that Spectre might be in command of the baseship pursuing the fleet, as he was last seen in that very position, commanding Baltar's former baseship, in Surrender the Galactica. The inhabitants of the village on Arilos drive vehicles called hover riders that look similar to the landspeeders of the Star Wars films. On page 3 of Part 2, Athena states her rank as Lt. Colonel. She was just a lieutenant during the events of the TV series, but it's logical to assume she would have been promoted by now. 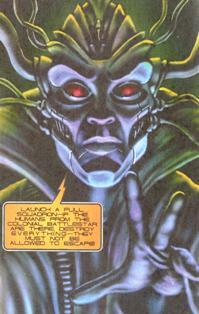 On page 4 of Part 2, we see that Spectre has undergone quite a change since he was seen (visually) in "The Young Lords". Notice he has a somewhat more human face now. One of the men of the village tells Athena they are a small settlement established by pioneers who left the Colonies before the Great Holocaust. Presumably, the holocaust is a reference to the annihilation of the Twelve Colonies by Cylons as depicted in "Annihilation". But if these pioneers left before that, how did they learn about it? Page 6 of Part 2 seems to imply that Commander Adama had somehow saved the life of the father of the boy called Adama at some point in the past and that the boy was named after the elder Adama in honor of the man's life saved. Did the elder Adama somehow travel this far out into space at some point in the past and then return to the Colonies? Or had the unborn-boy's father lived in or near the Colonies during the Cylon war? The narrative on page 1 of Part 3 describes Athena as the executive officer of the Galactica. Perhaps Colonel Tigh has already taken a position on the Council of Twelve by this time as later depicted in the novels by Richard Hatch. This concluding chapter of the story implies that both the old man and the medallion worn by the boy are connected to the Beings of Light. The last page of the story also implies that the old man is actually the boy's father. The overall story bears some similarity to Star Wars: A New Hope. In both, a boy whose never known his real mother and father, from a small town on a forgotten desert world, meets an old man whom his adopted family thinks is crazy and tells him to keep away. The old man turns out to have a connection to his father and aids the youth into tapping into cosmic forces and leaving the planet for a greater destiny among the stars. What was the mission of the Colonial craft and crew? When the ship is struck by Cylons and the computer and light speed drive are destroyed, the pilot sends out a Unicom message that he believes will be his final report, saying, "I can only hope that the others were more successful." Successful at what? Was it merely a typical expedition for food and supplies on nearby planets? If so, why would the executive officer (Athena) be on board for such a typical mission? Who is the old man? Is he human or a Being of Light (Seraph)? Or both? And if he is the boy's father, why did he hide the fact? Who was the boy's mother? Was she human? What is the destiny of the young boy named Adama? It seems that he will now go to live among the humans of the fleet for a "destiny among the stars". If his father, the old man, is a Seraph, does that make the boy at least a half-Seraph as well? Did Vulpa Six survive the attack against his forces by the Vipers? This is the last time the Command Centurion is seen.